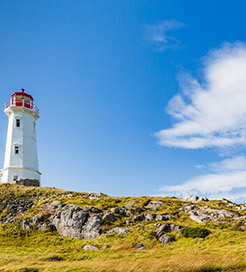 There are 2 ferry routes operating between Nova Scotia and Canada offering you combined total of 77 sailings per week. Northumberland Ferries operates 1 route, Caribou to Wood Islands which runs 9 times daily. Bay Ferries operates 1 route, Digby to St John (New Brunswick) which runs 14 times weekly. As the frequency and duration of crossings on some routes varies we would advise that you do a live search for crossings from Nova Scotia to Canada to get the most up to date information. Canada, the world’s second largest country by total area, is in North America, with the United States to the south and Greenland to the northeast. Synonymous with the great outdoors, Canada has a huge variety of impressive landscapes ranging from enormous mountains and glittering glaciers to eerie forests and picturesque beaches. Spectacular cityscapes can be found in the capital, Ottawa, the cosmopolitan Toronto and the French-speaking Montreal. Within these cities, you can delve into a vibrant arts scene, enjoy a diverse cuisine or let loose at incredible music events like Jazz parties and classical repertory theatre. If you’re looking to cross the border from the United States, there are regular ferry crossings from Seattle, Washington State to Vancouver Island. Plenty of domestic routes are available along the British Columbian Coast as well, with connections between the popular Victoria and Graham Islands.